It’s the time of year when I dig out my cherished flannel sheets, throw a down comforter on the bed and open the window a crack. Unfortunately the years have finally caught up with my favorite flannels..
Where was I? Oh yeah, back to the sheets. 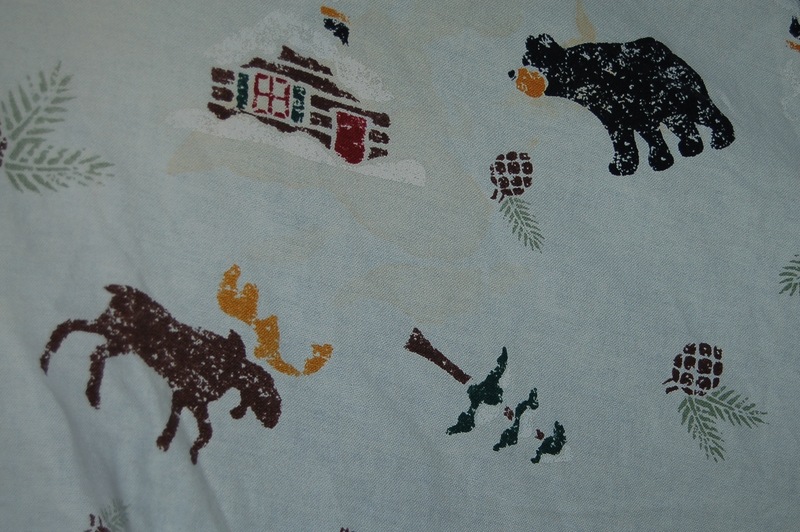 This particular set sports “primitive” style scenes of a log cabin, acorns, a moose, and a black bear ambling across the soft cotton. I saw a bear and a moose for the first time shortly after moving here, and many times since in the last 10 years. The log cabin has come to symbolize the year I bought these particular sheets. The year I moved out of the farm, shifting my role as mother and wife for a year. Coincidentally, or through fate, it was just two miles down the road from my home today. I spent the winter trying to find myself and the way forward. I rented the front half of a duplex log cabin. The landlord was sketchy and I’m quite sure roamed through my bedroom and stole my underwear from the cardboard file boxes that served as my dresser. It was quiet and totally my space, far from the farm and the life that was unraveling. But it was close enough that I stopped at “home” every day on my way to and from work. I made sure my daughters got off to school on time and kissed them goodnight before heading north to my cold cabin. Connected but distanced, I struggled to find a comfort zone I could grow in it, fertile ground. Every morning I am greeted with a gentle, pastel sunrise reflecting off the changing colors of the leaves as I head down the hills to the farm. I return to the cabin long after dark every night but the quiet, clean, peaceful, coziness of this house is welcome at the end of the day. My favorite part is snuggling down beneath the covers at the end join the dark, the moon highlights the trees outside my window. Everything” turns off” for the day. There is no more I can do. I can not diminish what divorce meant to the three people I love most. It devastated us all and I certainly didn’t find the answer to mend that tear in the fabric of our lives. After a long, dark, winter I did move back to the farm. My stay was brief, just long enough to confirm my fears that our former lifestyle was not sustainable. It felt like the universe, my universe, was just waiting for me to pick up a mirror and crash it against the sink. Everyone was looking at me waiting for the next move. These flannel sheets have comforted me through many nights of anguish and self-doubt, and now there is a hole in them too large to ignore. I caught a nail or perhaps just tugged them too tight around me one night. A tear has appeared in the top sheet, just below my chin. How strange, it is over my heart when I calmly drift off to sleep. This entry was posted in memoir. Tagged divorce, flannel sheets, inspiration, life after 60, life in NH, memoir, non-fiction. Nice… I think we can all relate to the comfort of fixing our bed/nest just right. Flannel sheets are hands down the best of all way to snuggle in. My Dad, on a separate note, used to wrap our Christmas presents in the same paper year after year, he would even make us carefully unwrap gifts to save the paper. When finally the end of the pile of wrapping paper became apparent, I was a married adult, he framed a swatch of it and gave it to me as a Christmas gift…. it was a joke, of course, but, still something I cherish. It reminds me of years of eye rolling by me and my brothers, exasperation at not being allowed to rip off the paper, he was of course lovingly torturing us intentionally….cheeky, wonderful fellow that he was..Could you find something to do with a “piece of your past” before you replace it??? Make pillows? something? What a perfect idea Doppleganger! I will make pillows from my sad sheets and always have them for comfort. Love what you Dad did with the wrapping paper. I also remember you always wrapping presents in the funny pages from the newspaper! Creative genius!! The Funny papers were the best, the packages looked all the same, yet each one unique to itself… lovingly saved each week for a whole year…. funny what we remember. I used to carry on the tradition, but funny papers went from two weekly sections to one, to barely one page. (sigh). Goes to my top 10 list of things that were better when….. I love the comfy that flannel sheets give a bed. Love the idea of making pillows from them. Perhaps Alice was trying to make sure she wouldn’t be laying on any of the acorns, lol. Do you really think Alice is that smart??!! Thanks Laura! I tried flannel sheets and, although I liked the initial feeling when first getting into bed, they made me too warm. I like cold sheets under a layer of a cotton blanket and down comforter…with the window open a crack. You are right, Joyce. During my nightly “power surges” the flannels can get too hot but I am usually glad for them when I wake up to a chilly morning. I’ve never tried flannel sheets but gardening got me through my divorce. It’s like the death of a family and I’m sorry that you had to go through it. Thank you Allen. Your analogy is exactly correct, hopefully everyone emerges and a “new” family dynamic can be built. Brilliant Cheryl! I wish I knew how to sew!! I think we were all much more inspired without feeling lessened by the recycling. We live in such a “throw away” society today. I always use a long thread, knot the ends together, and end up with a double thread to sew with when I make shelter dog beds as the seam will be sturdier. Just pulled out our flannel sheets as nights are cooler. They are cozy….and noticed a small hole in the comfy cotton top she we’d been using….Molly still mouths fabrics sometimes and it looks like her work…she’s just holding on to what makes her happy, I guess. We all should do that. A patch in the shape of a heart formed from a beloved piece of clothing! I love it Phil!! And as to the sewing lesson, I can’t sew on a button if it has four holes so this was inspirational. I will give it a shot. Oh, and paw waves to the Molly dog holding on to what makes her happy. A lesson for us all. My mom sewed everything from designer clothes (you could pay a lot and get special patterns) to couch upholstery. She it enjoyed it. Sewing is too tedious and bores me, but I still use basic skills like for shelter pet beds. Hand sewing is less trouble than a machine for me (you can stop and start and less mess) – you can probably google embroidery stitches (running stitch, cross hatch, or blanket stitch) if you want to get fancy – during the 60-70’s the return to the earth/hippie clothing brought something of a revival of handwork which was routine for every small girl child in the 17-1800’s. It’s a bit of a lost art. Clothing and household items are so cheap and frequently replaced that the time and effort seems a bit foolish….but for a few treasured items perhaps. Don’t feel bad, my daughter really doesn’t know how to sew – or replace buttons either. When she called as a resident in tears because her dog had eaten the corner off of her new ottoman, I said, “Look, you’re surgeon, grab some thread and pretend it’s a patient.” Maybe not the most beautiful stitch, but it worked. You have to start somewhere. HAHA. It’s hard to let go of comforting things. Making a pillow sounds like a plan. Found two more holes after the last washing so I’d better get started while there is still enough to hold together!